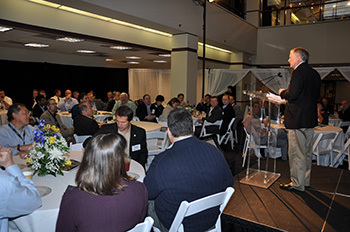 ATLANTA (March 17, 2015) — More than 100 top researchers and industry leaders converged on Georgia Tech’s campus last week to discuss ways to build on the Renewable Bioproducts Institute’s core capabilities in processing wood to pulp and paper and to find ways of further collaboration as it expands into the broader areas of bioprocesses and bioproducts. 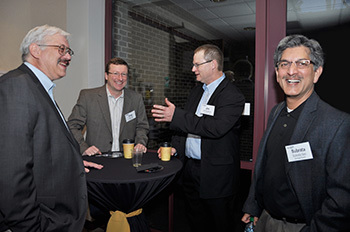 The annual spring meeting, entitled “Developing and Advancing Opportunities in the Bioeconomy,” was held March 10-11. 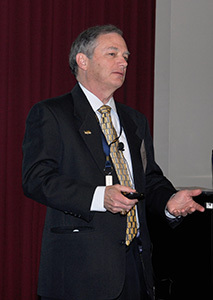 Thirteen member companies and 11 companies new to RBI registered for three tracks moderated by leading experts in their fields of research, which featured faculty presentations on research directions and opportunities in key strategic areas—“Catalytic Advances in Biochemical Production,” “Biocomposites and Nanocellulose” and “Operational Excellence in Advanced Paper and Packaging." The dialogue produced a list of research areas of particular interest to the group, including advanced separations technologies; advanced catalysis processes; mechanisms of formation/assembly of biocomposites and polymers; and advanced fibers for textiles, electronics and filaments. RBI – and Georgia Tech itself – serves as a portal for companies to find research that advances their needs in business. These partnerships are critical in today’s world of shrinking internal research and development funding. But the true potential of these partnerships can only be realized when there is a bridge between research and real-world application, according to Ben Wang, executive director of Georgia Tech’s Manufacturing Institute. “The Valley of Death can be understood as a broken value-chain between academia and industry. Our advanced manufacturing partnership capabilities are building a bridge across that valley,” Dr Wang observed. Marsolan believes RBI can serve as that bridge, and through these open dialogues, can remove the limits of what companies can achieve. 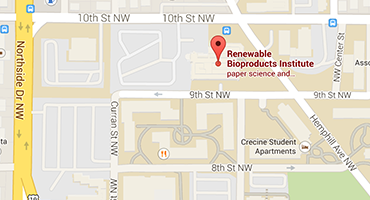 The Renewable Bioproducts Institute (RBI) at Georgia Tech builds on nearly a century of lignocellulosics research at Georgia Tech—one of the nation's leading public research universities and engineering schools. RBI is transforming products and processes with forest- and agriculture-based biochemicals and bioproducts to address challenges and create competitive advantages and opportunities for companies as they evolve in the bioeconomy.